The 6th Annual TOSA Decathlon will be held this weekend in beautiful Sebago Maine. This year’s event will feature knot tying and fire building, axe-throwing and double-ball, rifle and pistol accuracy, badminton and basketball, and a host of other competitive events designed to crown the 2014 TOSA Champion. 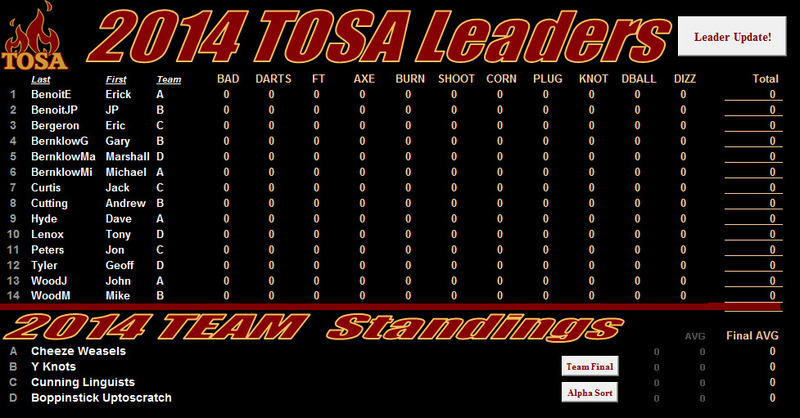 In all, 15 brave TOSA members will be participating and hoping to take home the TOSA Trophy. Make your plans now to join us in the 2015 TOSA Decathlon. Mark your calendar for the weekend after Labor Day, 2015, and join us. Ultimate TOSA bragging rights are at stake.